We’ve come to it, folks. The last stop in my Antarctic adventure with Quark Expeditions last January. In fact, today’s entry comes exactly one year after it happened, picking off from our final morning excursion in Orne Harbor. After our morning trip, we had a pair of fun activities to round out the day. 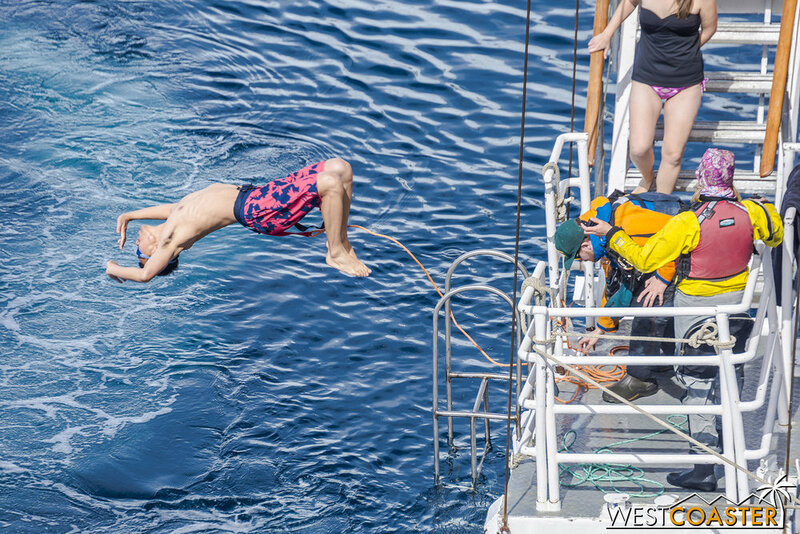 The first—the infamous Polar Plunge—was a chance for the more intrepid and cold-adverse passengers to do a traditional dive into the frigid Antarctic waters. Dozens of Quark Expeditioners actually lined up to participate in an entertaining performance. The second—a Zodiac ride-only out in Wilhemina Bay—marked our final proper excursion before it was time for everyone to turn around and start heading back toward our port of origin: Ushuaia, Argentina. 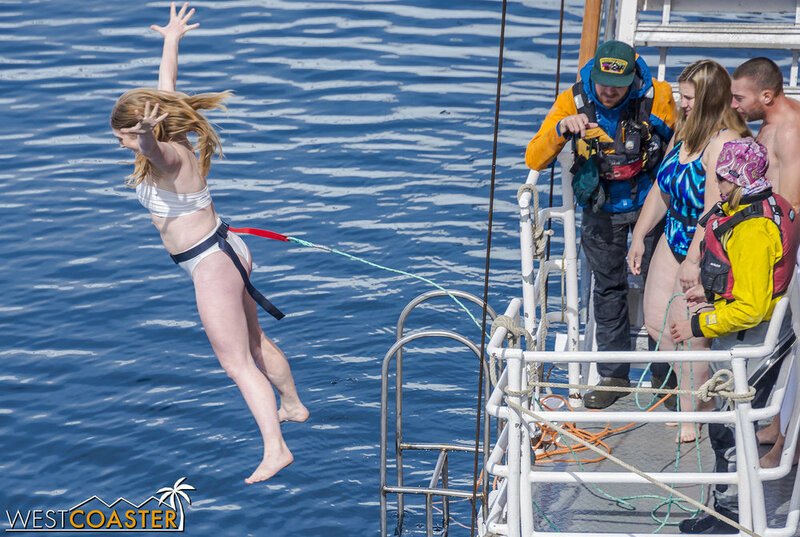 All cruise long, our expedition coordinators had been promising that we would be doing something called the Polar Plunge, wherein the bravest of the ship’s passengers would have a chance to dive into the frigid seawaters of Antarctica for a brief swim. They never scheduled it formally, instead teasing that it would happen when conditions would allow, and on this, the final day of our journey before our return to civilization, within the waters of Orne Harbor, it was finally time for the deed! 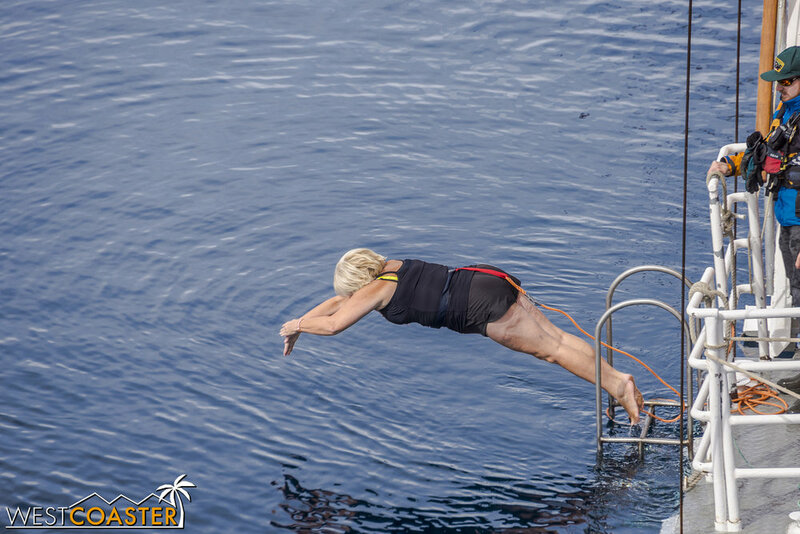 One of the first guests to dive in… this lady who brings a flamingo as company! 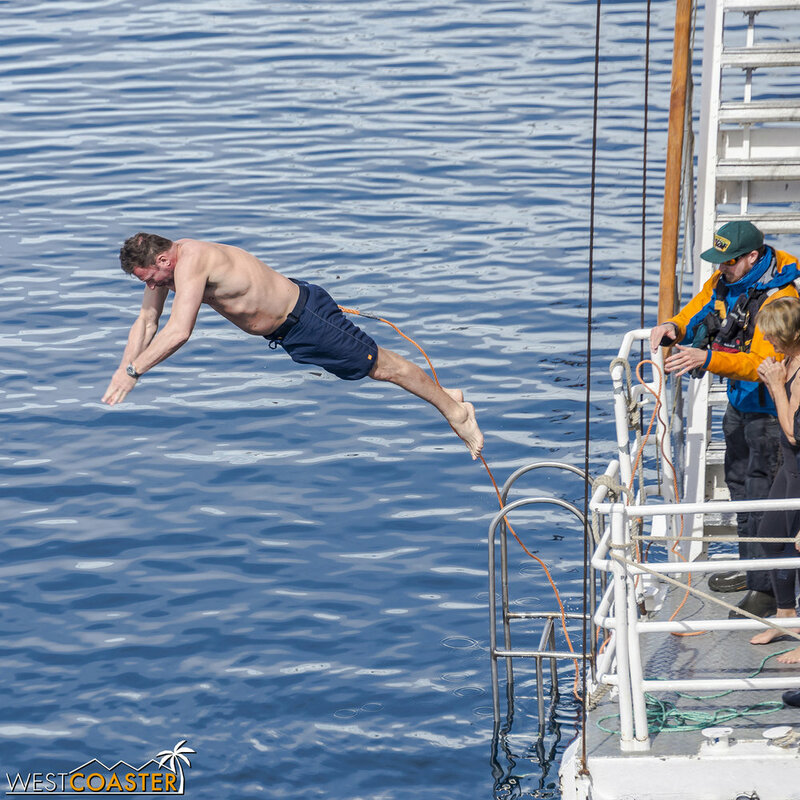 The Polar Plunge is not exclusive to Quark Expeditions. 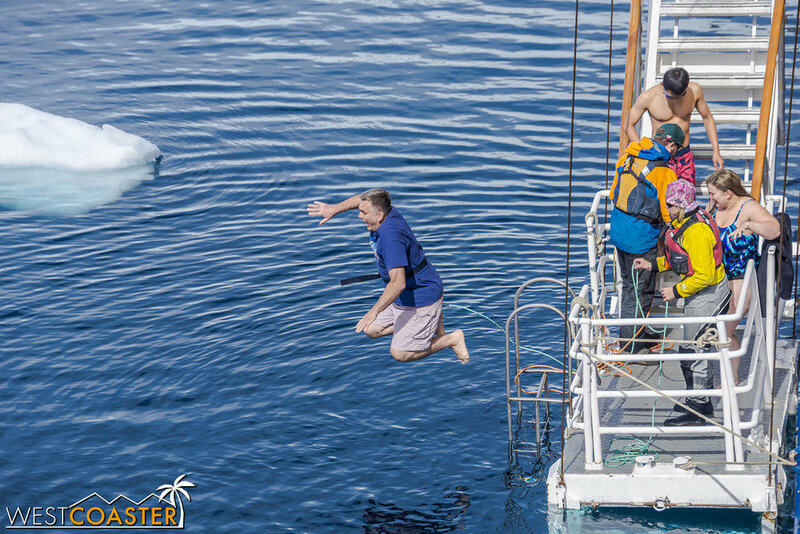 Pretty much every common Antarctica cruise line includes it as a complimentary but optional activity. 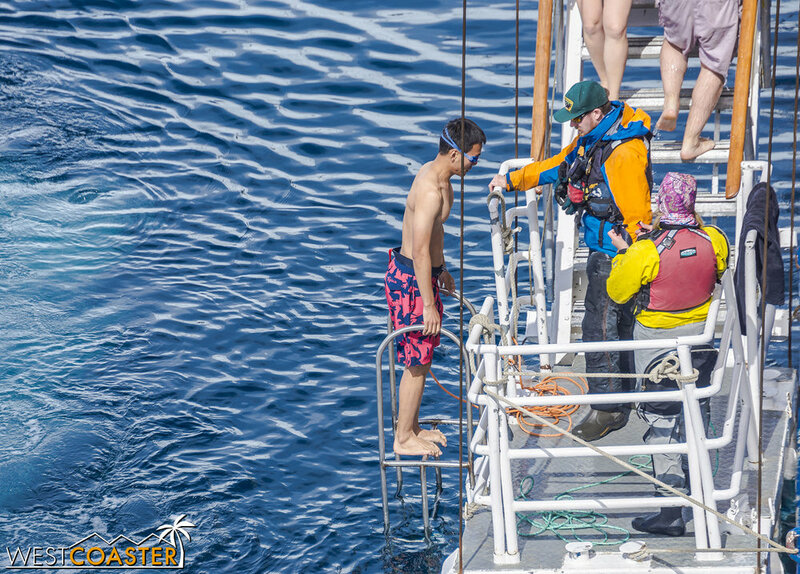 Guests, tied by a string back to the boat (in case of any unforeseen circumstances in the water) trek down to the lowest deck, where the floating dock drifts at water level, and then jump into the water! The water temperature is a very cold—just under freezing on account of the high salt content, which allows liquid water to remain liquid despite being a little under 32°F. But that doesn’t deter people from participating! 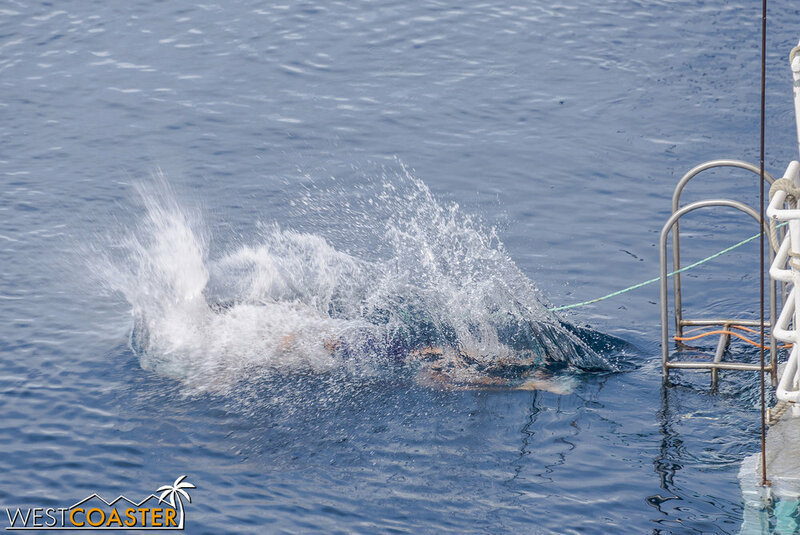 Some divers actually swim around for a little while after jumping in. On this particular late morning, I chose to sit out the Polar Plunge. I had a pretty good excuse: I was still under the weather from the viral respiratory infection I had contracted a few days earlier. But besides that, I really don’t like water sports and water activities in general. I’m an atrocious swimmer (to the point where I pretty much can’t swim except to save my life—and even that would only last a few minutes), and I just don’t care to get into water of any temperature under that of a warm shower. 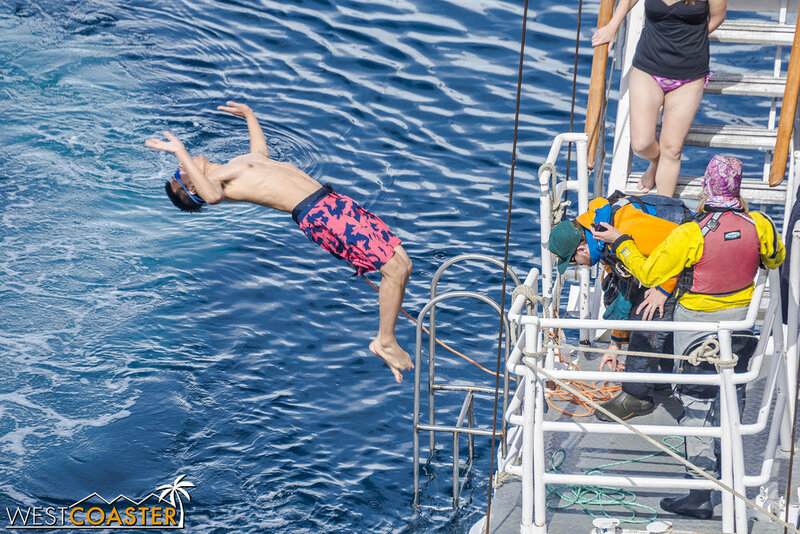 So from the spectator perch on the fifth deck, I kept my camera out, ready to capture my daring shipmates who were happy to jump right in! Some provide fantastic poses midair. Others smack right into the water with careless and highly hilarious abandon. With one chance for a photo op of a lifetime, why not pose for the camera? The Polar Plunge did make for a very enjoyable time. 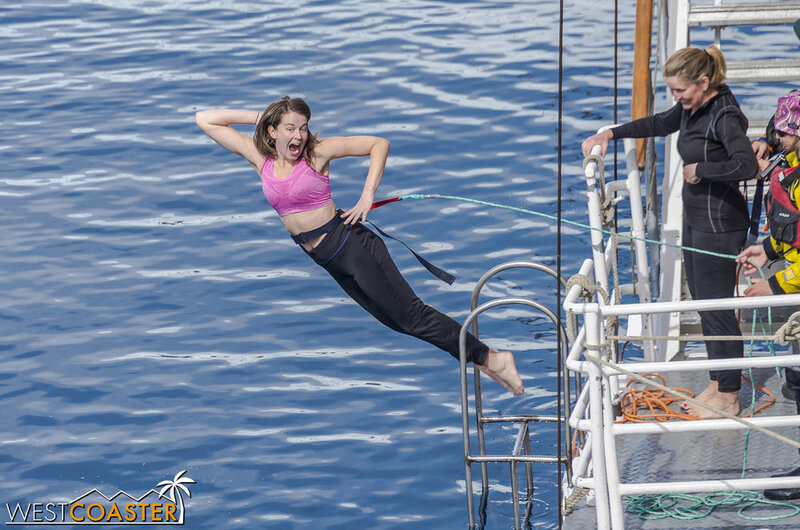 Several dozen cold-blooded (and possibly insane) passengers took part, and each seemed to place a personal flair to his or her water entry. Many simply hopped in, content to feel the shock of the water and then quickly swim back to the floating dock. Among those, there were some who initially swam the wrong way before turning around—much to their own chagrin! Others seemed to be in and out in a flash, intent on minimizing their exposure but still wanting to be able to boast that they had participated. 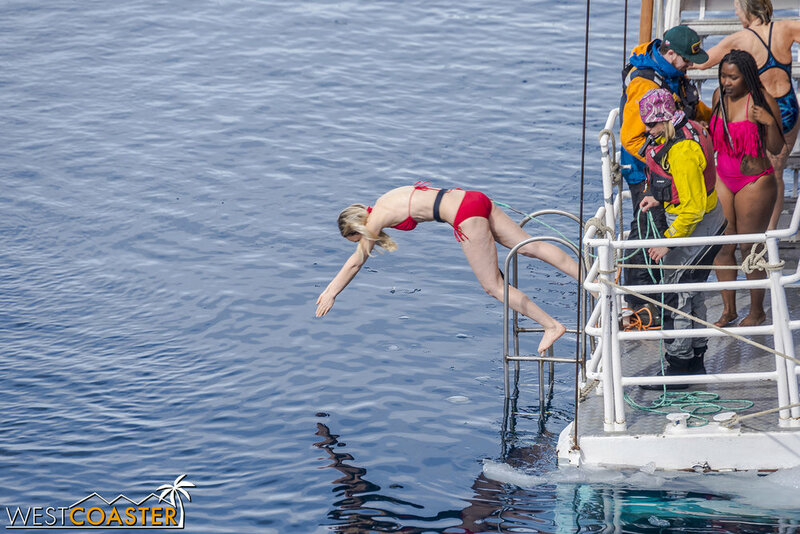 Others went for more stylish dives, holding poses in mid-air or comically belly flopping onto the icy but still waters. 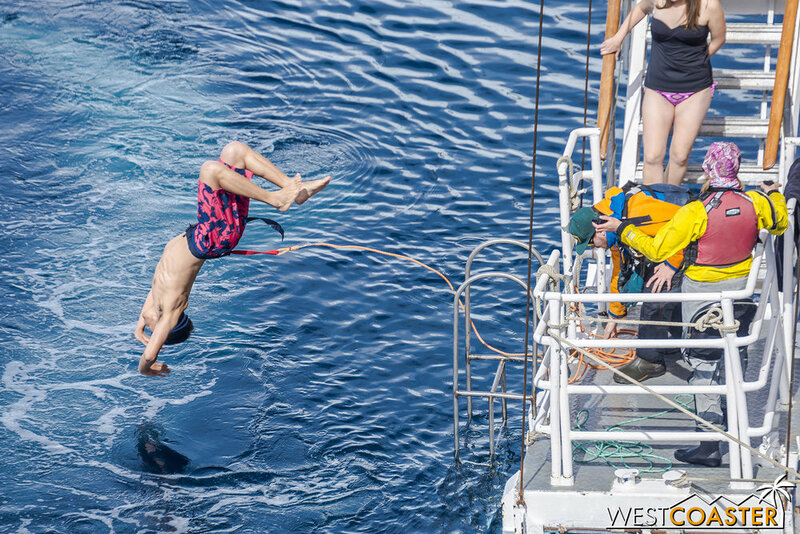 Our ship photographer, Dave Merron, captured quite a variety of fantastic frames right from his water-level vantagepoint, providing great souvenirs to hold onto for a lifetime! Though it’s technically against the rules to jump off the top of the ladder, some do so anyway! Then there were the athletic and acrobatic maneuvers that astounded and thrilled. 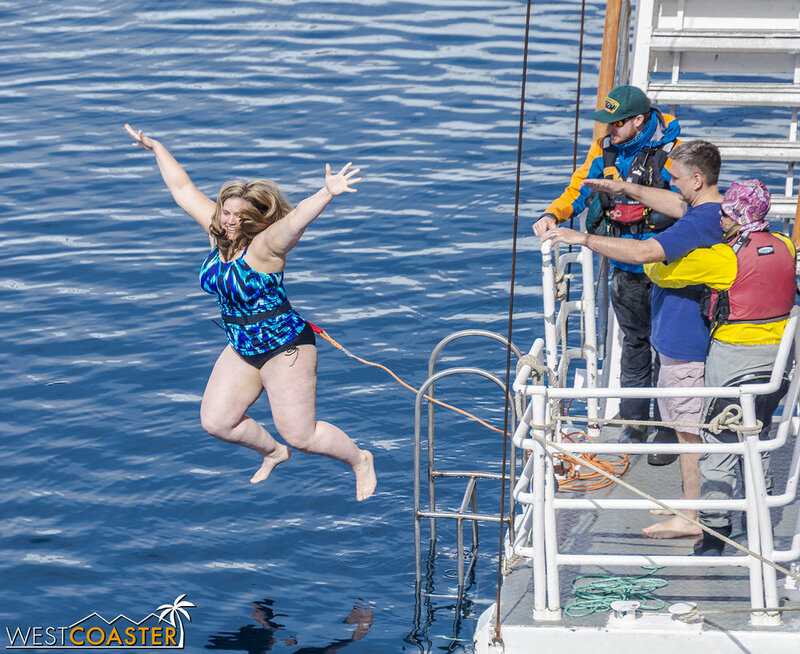 At least two of the guests decided to disregard the [loose] rules, climb onto the ladder, and backflip in a rousing arc into the water. The humming anticipation of the crowd, gasp at mid-backflip, and cheers upon water entry lent a sporting ambiance to the event, increasing the excitement among everyone watching—even those who had already gone and had scurried up to the upper decks, draped in towels, to catch the rest of the spectacle! In fact, some add some acrobatics to the process. According to most of those who participated, the water wasn’t actually that bad! Certainly, it was very cold, but the adjustment to the temperature came more quickly and easily than many expected. 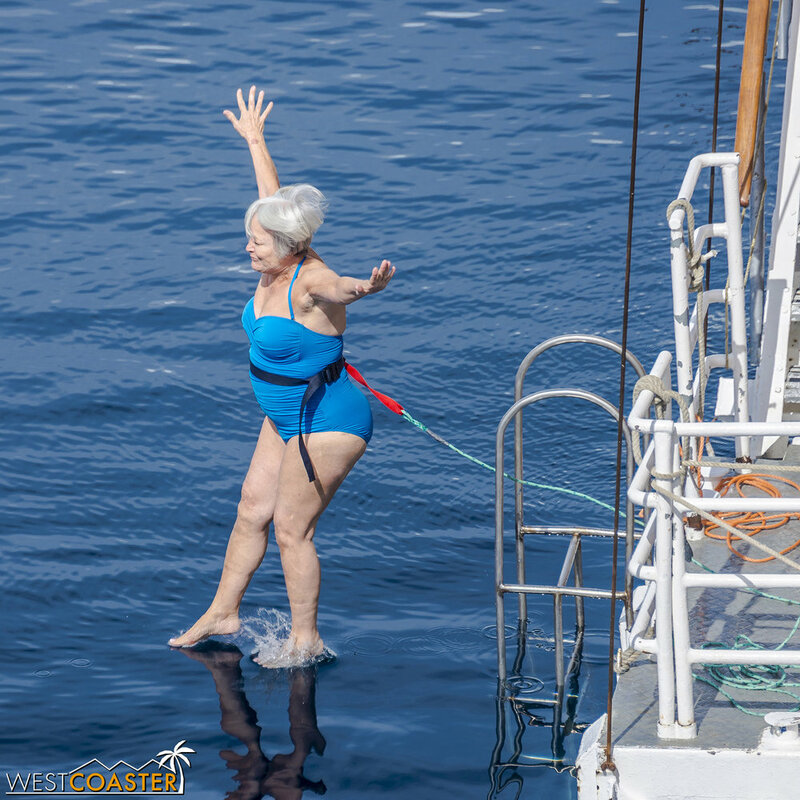 There were more than a few who extended their submerged time, lazily loping around the water for a spin before returning to the dock. Most are content for a fun pose and nice picture. It took over an hour, and there were even a few people who snuck in a second dive before the crew cut off the the line. But soon enough, the Polar Plunge was over, and it was time for lunch. After that, our final excursion of the trip, out in the waters of Wilhelmina Bay! 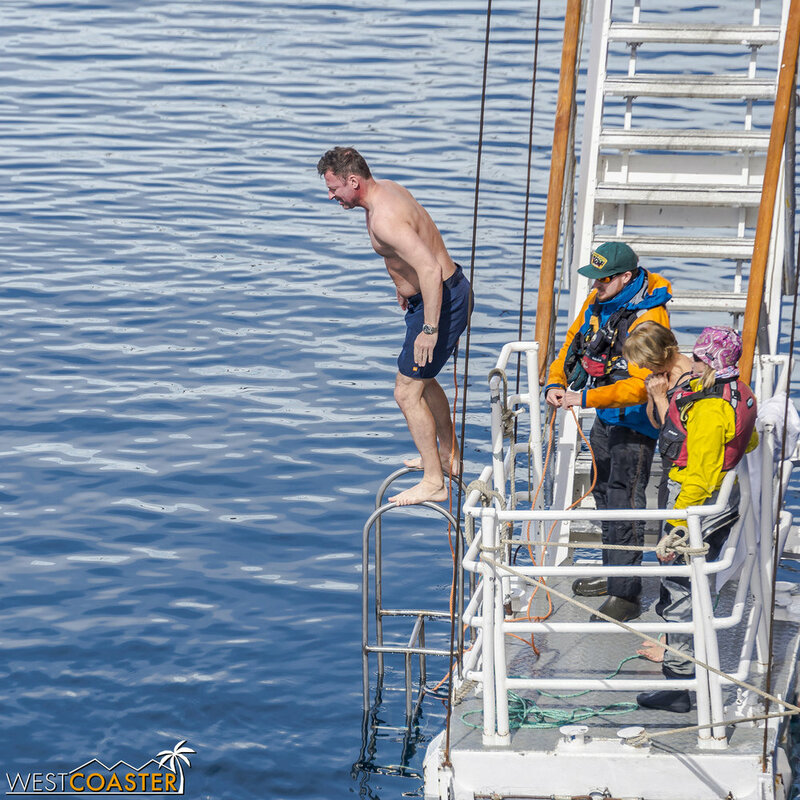 A couple of hours after the Polar Plunge, after we had also had time to eat our last lunch in Antarctic territory and recuperate a bit from the morning activities, it was onto our next and final destination in Antarctica. Here, in Wilhelmina Bay, we would be embarking on a cruise only—no landing included. 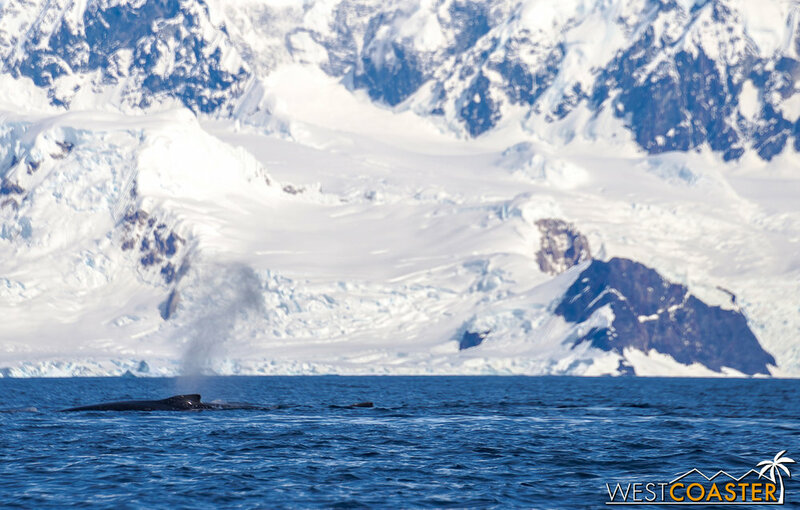 Within a sheltered and tranquil cove, we would take in the magnificent Antarctic landscape one last time on a beautifully sunny afternoon, with some added final instance of whale watching to boot! Strikingly photogenic peaks dot the landscape around Wilhelmina Bay. Snowcapped mountains and glaciers from a backdrop in front of large icebergs that are nonetheless dwarfed by their surroundings. Wilhelmina Bay was in the very late 1800s, by the expedition of famed Belgian Antarctic explorer, Adrien de Gerlache. 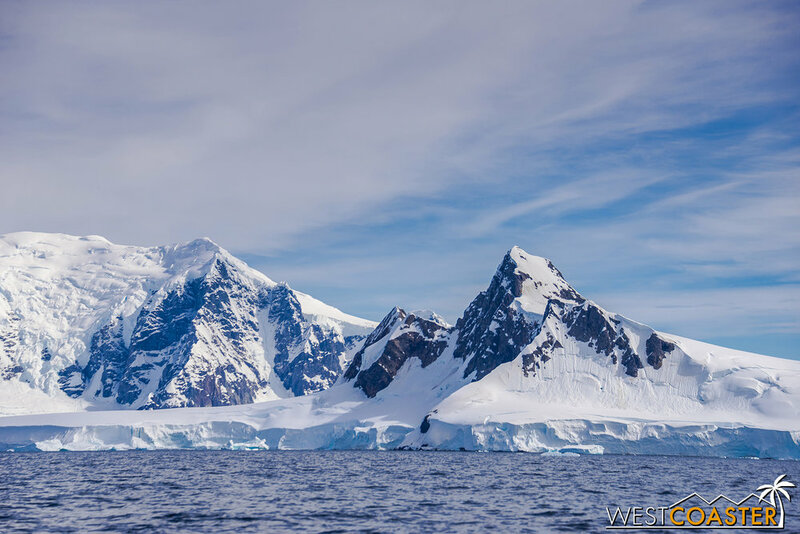 Named after the queen of the Netherlands, who was in power at the time, it didn’t hold much man-made function during the age of Antarctic exploration. 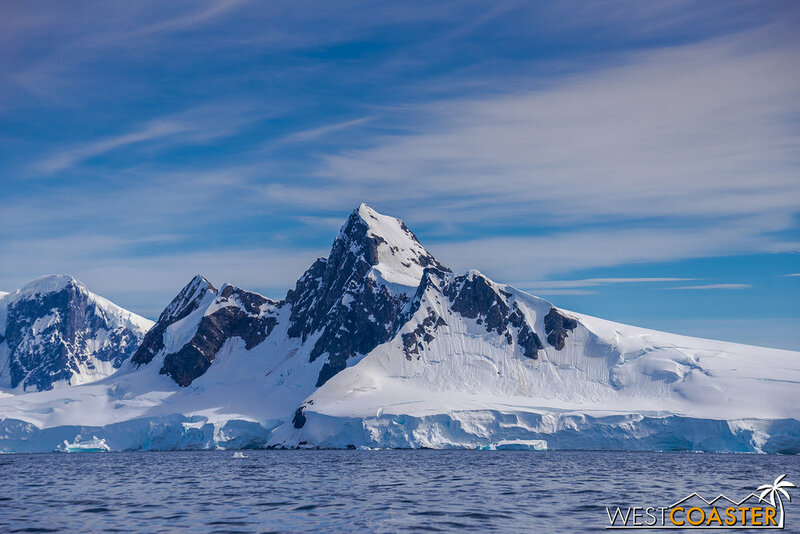 But in the current age of Antarctic tourism, Wilhelmina Bay has become a popular stop among multiple tour lines, thanks to its spectacular and dramatic scenery and abundant wildlife! A Quark Expeditions Zodiac boat cuts through the water on our final cruise of our trip. Our cruise out onto the bay was an opportunity to savor our last bit of time in Antarctica. In the short, four and a half days that we had been here, we had seen so much and made so many indelible memories. 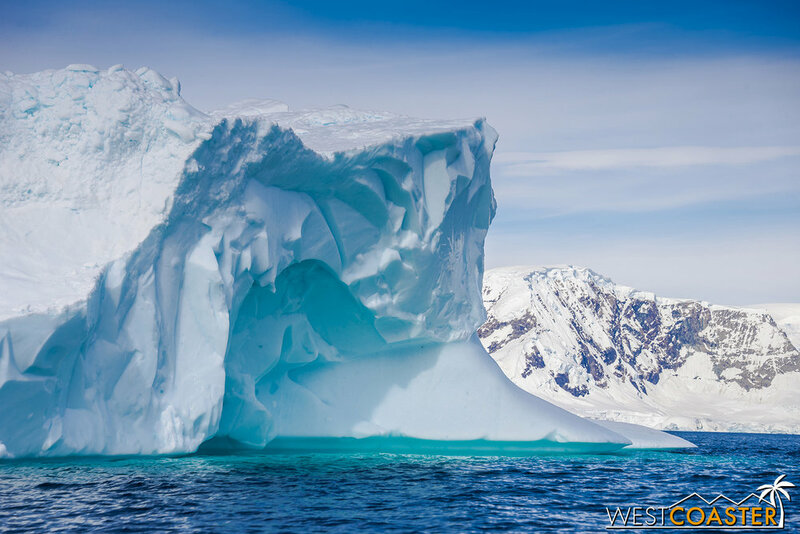 From the plethora of penguins and assortment of seals to the majestic glaciers and striking icebergs to breath-taking encounters with whales to brushes with the built history and scientific legacy of the various sites we visited, this trip had provided a wonderfully diverse sample of what Antarctica had to offer. 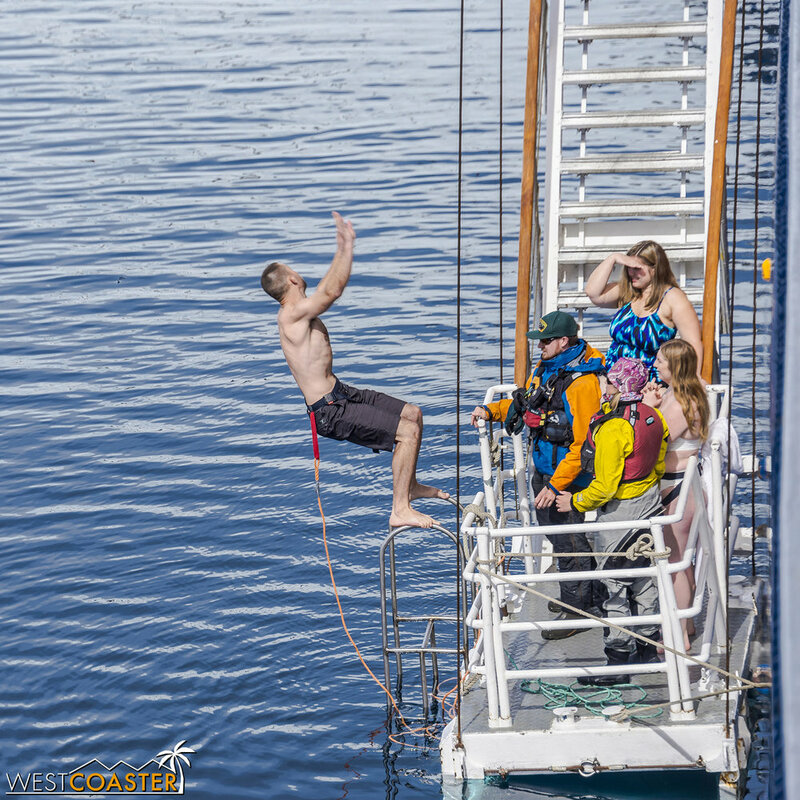 Rather than end with a high-adrenaline, physically taxing adventure, though, our cruise in Wilhelmina Bay afforded us the ability to connect on a more emotional level. The calm, lapping waters, the cool blue of the massive icebergs, and the captivating shapes of the cliffs, mountains, and glaciers enveloped us with a supremely sublime grandeur and splendor that soothed the soul. Passing an especially large and exquisite iceberg. It seems to have a cavern unto itself. The captivating blue colors and shaped texture of the packed snow and ice are exquisite. At times, our expedition coordinator would silence the engines and let us just drift, absorbing our surroundings through all of our senses. The crisp brine of the air… the rhythmic lap of the quiet water… the salty spray of the seawater… they all combined to offer us a moment of true serenity. This was bliss in the moment, worries melted away, everything fitting together and making sense for one brief period in time. The scenery was not the only item of note on this trip. Wilhelmina Bay has long been nicknamed “Whale”helmina Bay on account of the large number of humpback whales that frequent the area. And on this day, we spotted a pod of them lazily drifting and diving nearby, halfway into our cruise. Though we weren’t able to be as near to them as that incredible morning in Neko Harbor, it was still a treat to witness these glorious and might beasts of the sea in relative proximity. The watery jets of mist from their blowholes lent a peaceful, relaxing soundtrack to the placid ambiance. The flukes of their tales when they dove deeper into the bay to feed offered memorable shapes to photograph. It almost felt like play for them—and maybe it was. But this simple happiness was infectious, placing a much-appreciated positive cap on our cruise. A pod of humpback whales provides a grand capper to our wildlife encounters for the trip. Familiar shapes of tails and fins cutting through the water. The spray of a whale’s exhale… both awe-inspiring and calming at the same time. Water cascades over the tail as a humpback dives. These giant creatures are also dwarfed by the continent around them. Our last minutes before we returned to the Ocean Diamond took us away from the whales, to a quieter part of the bay away from the other Zodiacs. There, we and our partner raft enjoyed one last time in the purity of Mother Nature, drawing in the untouched magnificence of the most remote planet and remote land on Earth. To think… what we saw was just a tiny fraction of the continent itself. It was its most pleasant attractive facade. There was also the darker, more intense, less forgiving facade that comes with the Antarctic winter and the occasional storms that may randomly manifest. The scars and texture of the towering mass of continent bore hints to this. But on this dazzling day, it was Antarctica’s charms that stayed with us. Back to the ship we go. But one more gaze upon the Antarctic continent before we depart. To our bittersweet sadness, our time on the water eventually came to an end. We would have two more days in transit back to Argentina, but the prime of our trip was now behind us. What an incredible time it had been, and all passed by too soon. We had made memories and friends, gained knowledge and respect for the landscape, and become ambassadors to the 7th Continent. With this adventure of a lifetime, we had enriched our souls and strengthened our love of this amazing, diverse, and spectacular planet even more.